There are 10 points to follow in the Charter, recommendations that range from “Indigenous-led,” and “Deep listening” to “Impact of Design,” and “Reconciliation Action Plan (RAP)”. 3. Can you give some regional context regarding First Nations design in Australia? How can the Charter become a model for other nations to follow? 5. Why now? Can we widen the discussion to touch on its relationship to the truth and reconciliation initiatives that have happened all over the world since the 80s (with many more happening in the years 2000+)? Unaipon Helicopters – brand mark inspired by Aboriginal inventor who conceived the helicopter in 1914. Bunjil’s Wings, Melbourne Museum. Bunjil the Wedge-tailed Eagle is the creator (Kulin nation). Kinetic sculpture by ENESS. 6. Addressing the past ‘truths’ of so many Indigenous people’s stories as a first step seems so key before the next steps of reconciliation can have firm foothold. What have proven to be good examples of making more design that is truth- and story-telling from the Indigenous perspective? 7. What about loss of ‘social capital’— the loss of bonds between families and communities as well as the loss of trust between law and governmental bodies — for Indigenous groups all over the world; has there been trickle-down effect on fair working practices for Indigenous designers? How might the Charter will play a role in reinstating this social capital? 8. What does the ‘too hard basket’ refer to? 9. The Was.Is.Always: South to North workshop held in Greenland, Sweden and Denmark asked design students to face the issue of indigenous-led design head-on. How did this initiative serve as testing ground and bridge for building a global Indigenous Charter? 10. As a larger outcome, Brian has talked about achieving a broader ‘cultural competency’: a better ability to deal with indigenous culture, understand it, respect it, embrace it and not marginalise it. How does the visibility of design make it a good medium to ‘consult with culture’ and then share what has been learned with the world? 11. Can you talk about a case study where Australian designers were asked to work with Indigenous identity in a design project and were successful at not losing its meaning? 12. How do you foresee the next generation incorporating the Charter as a tool? What have been some of the generational challenges when conceiving of it? 13. How will the agreement between INDIGO and ico-D play a role in the Charters development and implementation in the coming years, and which aspects of the Charter will be presented very soon at the World Design Summit? Russell Kennedy is a Senior Lecturer and Course Director of Design at Deakin University. Kennedy’s research is in the area of cultural representation focusing on the relationship of indigenous visual culture to national Identity. Kennedy’s PhD thesis is titled Designing with indigenous knowledge: Policy and protocols for respectful and authentic cross-cultural representation in communication design practice. Kennedy is a Fellow of both the Royal Society for the encouragement of Arts, Manufacture and Commerce (RSA) and the Design Institute of Australia (DIA). He was President of the International Council of Communication Design Icograda (2009-2011) and a board member (2003 -2013). Kennedy was a Regional Ambassador to INDEX: ‘Design to Improve life’, the Danish Government’s International Award program (2007-2013). ico-D Secretary General, Tyra Von Zweigbergk and Dr Russell Kennedy, Deakin University and former ico-D President (2009-2011), sign the INDIGO MOU at Greenland House, Copenhagen, as part of Was.Is.Alwaysevent. On 20 November 2016 ico-D Member Deakin University signed a Memorandum of Understanding (MOU) with ico-D as a part of a formal commitment to transfer management of INDIGO, the International Indigenous Design Network, to Deakin University for the next five years. 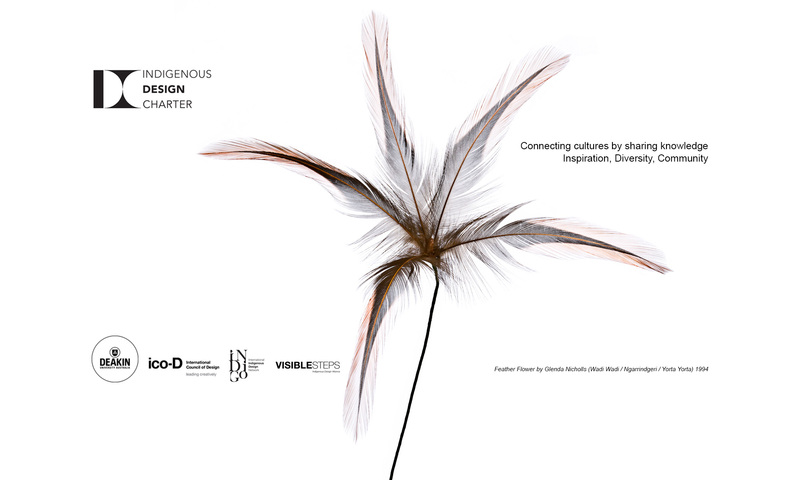 The agreement included a plan to launch the International Indigenous Design Charter as a flagship project for INDIGO during 10 Days to Change the World in Montréal next year at the World Design Summit. The MOU signing happened at Greenland House, Copenhagen as part of Was.Is.Always event organised by Deakin University and aligned with the 10-year anniversary of the pilot INDIGO project called MIX06 involving Robert L. Peters, former ico-D President and Koopman Distinguished Chair in Visual Arts at the University of Hartford, Connecticut USA. INDIGO was officially launched a year later in La Habana, Cuba at the ico-D World Design Congress 2007. Was.Is.Always: South to North involved a series of events in Greenland, Sweden and Denmark designed to gather data to produce a first draft of what will be INDIGO’s cornerstone project, the International Indigenous Design Charter. Speaker Maya Sialuk Jacobsen at the KEA University Workshop, Copenhagen for the Was.Is.Always event, a Copenhagen-based Greenland/Inuit designer and tattooist. Although globally focused, the Australian Government, Department of Foreign Affairs and Trade (DFAT) supported Was.Is.Always: South to North. Damien Miller, the Australian Ambassador to Denmark, Greenland, Norway and Iceland attended the workshop hosted by the University of Greenland in Nuuk. Dr Russell Kennedy, Deakin University and former ico-D President (2009-2011) and Damien Miller, Australian Ambassador to Denmark, Greenland, Norway and Iceland. ‘Tradition-inspired contemporary design’ by Liss Stender, an Inuit designer who spoke at the Greenland University workshop in Nuuk, Greenland as part of Was.Is.Always. A Viking moment for Michael Nona one of the Was.Is.Always students. Established in 2007, INDIGO, the International Indigenous Design Network, is an open platform that connects designers worldwide in an effort to explore our understanding of indigenous design. It provides an online forum for sharing ideas and information, fostering discourse among participants and contributing to the furtherance of indigenous and local design. Through its participants and projects, INDIGO seeks to gain some insight into what makes design distinctive to its home, the connections to the place where it is made and for whom it is made. INDIGO’s role will also to act as a meeting place to share knowledge. As more and more designers work within a global context seemingly without borders, INDIGO provides an online medium for design practice as it contributes to the formation of national cultural identities. In 2010, INDIGO introduces Mother Tongue, an online exhibition that attracted more than 500 submissions in response to an international call for entries. In 2010 the Mother Tongue exhibition traveled the world starting in Forli, Italy and Taipei, Taiwan (Chinese, Taipei). In October 2012 Rediscovery, the INDIGO themed, Ico-D Design Week in Sarawak formed part of an international platform to further develop INDIGO’s mission and vision. In 2016 Russell Kennedy states, “Deakin University makes a commitment to continue the mission and vision set by Ico-D for INDIGO, the International Indigenous Design Network”.